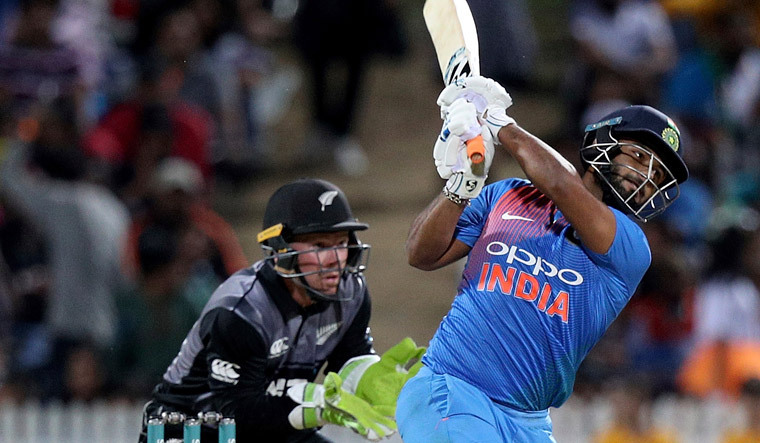 New Zealand denied India a perfect finish to their highly successful tour Down Under by clinching the T20 series 2-1 with a narrow four-run win in the series-deciding third match at Hamilton on Sunday. India needed to knock off a stiff 213-run target to bring curtains on a memorable three-month tour in a befitting manner, but fell just short. Krunal Pandya was the most expensive of the Indian bowlers, bleeding 54 runs in his four-over quota. If it was not for left-arm Chinaman Kuldeep Yadav (2-26)'s tight bowling in the middle-overs and Bhuvneshwar Kumar (1-37), India would have got a bigger target to chase. India needed 16 runs off the final over and Dinesh Karthik (33 not out off 16) after taking a double off the first ball, stunned the crowd and his teammates by refusing to take a single in the third ball. Krunal (26 not out off 30) had reached the striker's end, but Karthik did not run, sending his partner back.